PetAlive Thyro-Pet - Natural Remedy for Hypothyroidism in Pets - 2 oz. 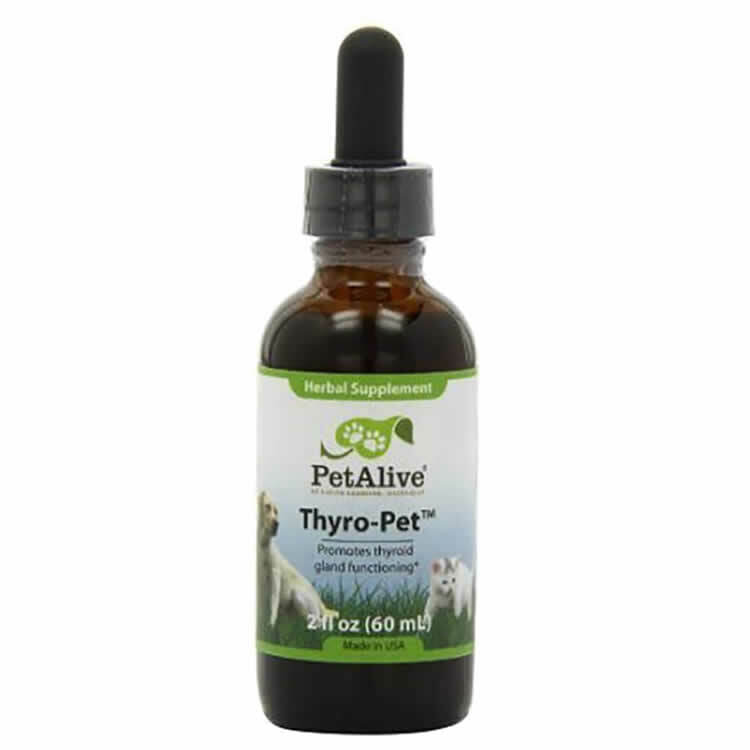 Home > Health Issues > More Health Conditions > Hypothyroidism > PetAlive Thyro-Pet - Natural Remedy for Hypothyroidism in Pets - 2 oz. Thyro-Pet is a natural remedy to promote healthy thyroid functioning for pets with thyroid problems such as hypothyroidism. Thyro-Pet is not recommended for pets with hyperthyroidism. Restore healthy thyroid functioning in dogs and cats. Treat hypothyroid conditions caused by iodine deficiency. Ensure adequate production of thyroid hormones. Assist with fatigue, constipation, weight gain and other symptoms associated with hypothyroidism in dogs, cats and other pets. My dog was stumbling a lot, losing her appetite - - could barely make it outside and then back in the house. We had to help her up our one step. I did some research and thought it might be thyroid. Started her on Thyro-Pet and within days she was so much improved. Now she eats well and runs up and down the steps, her balance is completely back to normal. The change in our cat is AMAZING!! Within 3 days he was more active and loving. He eats them on his treats without noticing it's there. So far, this seems to be working well. My dog had some hair loss and it's all growing back in. I'll have her blood work redone in 4 months or so, but I'm pleased so far. Bladderwrack (Fucus vesiculosis) is a sea vegetable which is a prime source of iodine - crucial in supporting thyroid health. It has been used in humans for thousands of years, especially in Chinese tradition, and is just as beneficial in domestic animals. Apart from the beneficial effect on thyroid functioning, kelp is also used as a metabolic tonic and will help tubby pets support weight management. It has been studied for its ability to support health. When using kelp for people or pets, always make sure that it is sourced from a reputable and trusted company. Kelp harvested from the beach or near to the coast may be contaminated with industrial waste, sewage, lead, mercury or other toxins. Kelp used in Thyro-Pet has been harvested only from uncontaminated areas and screened for the presence of toxins, heavy metal and other contamination. Astragalus (root) is an herb which has been used in Chinese Tradition for many centuries as a revitalizing tonic for the endocrine system. It is a very useful supporter of thyroid and adrenal gland function and also helps to maintain blood pressure levels already within the normal range. Recent research also confirms that Astragalus supports the immune system. Eleuthero (root) is a botanical cousin of Panax ginseng and has been used in ancient China for thousands of years to support healthy energy levels and endurance. This herbal ingredient is excellent for maintaining healthy energy levels. Recent research has shown that regular use of Eleuthero will help the body with stress and support the immune system. Nettle (leaf) is used traditionally and in modern herbalism as a circulatory tonic to support healthy metabolism, thyroid and adrenal function. Thyro-Pet comes in convenient tincture form. The drops are easy to administer to pets and may be mixed with food or a treat. For more information, visit our webpage - Hypothyroidism in Pets. If you are administering a natural thyroid remedy to your pet, it's important to have the animal's thyroid checked regularly (at least every six months) to ensure hormones are within safe ranges. Safety during pregnancy and nursing has not yet been established. Not recommended for hyperthyroid conditions.